Ask The Muscle Doc: Is Training To Failure Necessary? Are you an every-set-to-failure lifter? Or one who never even gets close? Here's how to optimize your sets to end at the right time for maximum results and minimum risk. Q: Is training to failure necessary for muscle development? And if not necessary, is it advisable? This is a timeless gym question, and one that is still the topic of contemporary research. So, before you just ask the biggest guy in the gym (Spoiler alert: he's going to answer "Of course!") let's dig deeper. First off: There's no doubt you can gain appreciable muscle without going to muscular failure. This was conclusively shown in a study that randomized young college-aged men to perform 4 sets of arm curls, either going to failure or stopping a couple reps short of failure. The load was set to 85 percent of their one-rep max (1RM), which translated to approximately 6 reps per set in the failure group, and 4 reps in those not training to failure. After 12 weeks, all groups significantly, and similarly, increased their biceps size. In support of these findings, a more recent study found roughly equal quadriceps growth when performing 3 sets of leg extensions at 80 percent and 30 percent of 1RM, regardless of whether sets were taken to failure or terminated when participants felt they'd simply had enough. The caveat: The subjects in both studies were newbies to lifting. 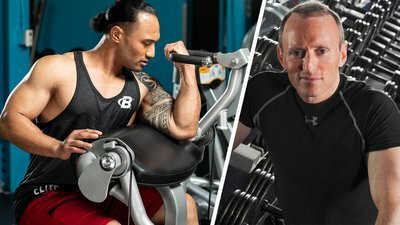 Some have speculated that resistance-trained individuals must go all-out to optimally stimulate the full spectrum of muscle fibers. Although there is little in the way of controlled research on the topic to draw definitive conclusions, a case can be made that training to failure at least ensures that you sufficiently overload the muscles to continually adapt. The question then becomes, "Is there any downside in training balls-to-the-wall on each and every set?" The answer: Quite possibly. For one, going to failure tends to decrease the amount of volume you can subsequently perform in a given training session. Since volume has been shown to be a primary driver of hypertrophy, such reductions can potentially impair the growth response. Moreover, consistently training to failure may hasten the onset of some manner of overtraining, which can bring gains to a crashing halt. Now, before you call the overtraining-is-a-myth brigade, hear me out. Considering the lack of direct research on the topic, we're left to draw our own conclusions on training to failure. So, here's mine. Selectively training to failure, provided it is properly managed, may help to eke out the most of your muscular potential. My suggested approach is to leave a rep or two in the tank on your initial sets of an exercise and then go all-out on your final set. Dorian Yates, amongst others, employed such a strategy with much success. However, it's important to take into account the specific exercises performed. Compound movements, particularly those performed using free weights, are substantially more taxing on the neuromuscular system than single-joint exercises. You should therefore remain judicious with going to failure in exercises such as squats, deadlifts, presses, and rows, limiting use of the strategy over time in these types of exercises. Alternatively, failure can be employed more liberally when performing single-joint exercises as they are much less physically and mentally demanding, and hence going all-out doesn't have significant negative effects on volume. On the biceps machine or doing cable push-downs? Go for it. Deadlifts or bench? Maybe not. Failure training can be implemented more liberally when you do it for relatively short periods of time. A four-week mesocycle, where a majority of sets are taken to failure, can be used as a "shock phase" to promote a super-compensatory response, elevating your physique to a new level. However, follow such a training block with several months of reduced use of failure. This will ensure a balance of stimulus and recovery for continued long-term progress. Sampson, J. A., & Groeller, H. (2016). Is repetition failure critical for the development of muscle hypertrophy and strength?. Scandinavian Journal Of Medicine & Science In Sports, 26(4), 375-383. Nóbrega, S. R., Ugrinowitsch, C., Pintanel, L., Barcelos, C., & Libardi, C. A. (2018). Effect of Resistance Training to Muscle Failure vs. Volitional Interruption at High-and Low-Intensities on Muscle Mass and Strength. The Journal of Strength & Conditioning Research, 32(1), 162-169. Willardson, J. M., Norton, L., & Wilson, G. (2010). Training to failure and beyond in mainstream resistance exercise programs. Strength & Conditioning Journal, 32(3), 21-29. Schoenfeld, B. J., Ogborn, D., & Krieger, J. W. (2017). Dose-response relationship between weekly resistance training volume and increases in muscle mass: A systematic review and meta-analysis. Journal of Sports Sciences, 35(11), 1073-1082. Fry, A. C., & Kraemer, W. J. (1997). Resistance exercise overtraining and overreaching. Sports Medicine, 23(2), 106-129. Izquierdo, M., Ibanez, J., González-Badillo, J. J., Hakkinen, K., Ratamess, N. A., Kraemer, W. J., ... & Gorostiaga, E. M. (2006). Differential effects of strength training leading to failure versus not to failure on hormonal responses, strength, and muscle power gains. Journal of Applied Physiology, 100(5), 1647-1656.